What role do your muscles, fascia and ligaments play in your level of back pain? While any one of the above listed body systems or tissue types may play a role in your back pain and the healing of it, for spinal rehab, as well as for understanding what happens in a surgery, you’ll likely be concerned with just a few. In general, “soft tissue” is used when describing muscles, tendons, ligaments and/or fascia. Muscles are the engines of movement; they power the changing of body shape and positions and they move your whole form from one place to another. Unlike the other types of soft tissue, muscles contract and relax, a process that is directed by the nervous system. 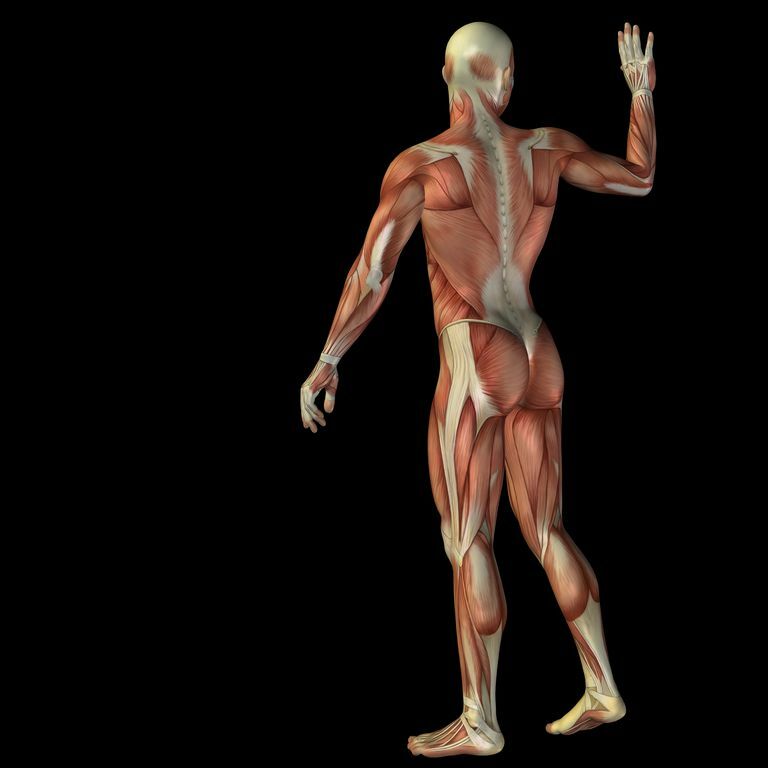 Muscles surround joints, protecting them and working together to provide movement there. Getting muscles strong enough to support your back and flexible enough to allow you to easily move in all possible directions is often a goal of spine physical therapy. And in a neck or back surgery your doctor may have to disrupt certain muscles in order to reach the particular structure on which she intends to operate. If the surgery is a traditional, open type, i.e., it is not minimally invasive spine surgery (MAST), this disruption may greatly impact your healing time. But if your low back pain really is due to tight low back muscles, consider trying this quick and easy tension tamer: Quick Back Muscle Release Program. Another important type of soft tissue for back and neck therapy is fascia. Fascia is a covering that surrounds muscles at every level, from the microscopic cell, to the fiber bundles that comprise individual muscles to the muscles themselves, plus muscle groups and the entire musculoskeletal system. The purpose of fascia is to support the integrity and movement of muscles. Ideally, fascial fibers glide smoothly but when you’re injured, or you have posture issues, they can get stuck. Because the fascia wraps around muscles, when it gets stuck, it can be mistaken for muscle tension. A technique called myofascial release is often employed by manual therapists to remedy this. If you're not in treatment, consider using tennis balls or a foam roller to work out the fascial “kinks” and “glitches” as you feel them. When used appropriately, proponents of self-myofasical techniques such as these say they may result in pain relief and increased movement freedom. Fascial fitness systems are gaining popularity, too. Most involve myofascial release, as described above, combined with bouncy movements to help restore the natural elasticity of the fascial covering. Ideas from the fascial fitness field have begun to permeate into more established systems such as yoga and Pilates. Ligaments are tough bands of connective tissue that strap the bones of a joint together. Because they cross joints, they help prevent excessive, potentially harmful, movement. Tendons, made of a different type of connective tissue, attach your muscles to your bones. When a muscle contracts, it tugs on the tendon that arises from it, and the tendon moves the bone to which it is attached. If you injure a muscle, it’s called a strain; injury to a ligament is called a sprain. Grade one is mild; and example is a pulled muscle or tendon after a day of gardening or yard work. Grade three represents a complete rupture. It is a very serious injury that requires emergency first aid and immediate medical attention. The overall condition of your soft tissue can also influence your pain levels, especially when they are out of shape, too tight or overstretched. An exercise program that emphasizes alignment and balance through the body may contribute to the heartiness of your muscles and fascia, plus keep strain out of your ligaments and tendons; and because of this, it may well help reduce pain levels.